Yko Tawada ( Tawada Yko, born March 23, 1960) is a Japanese writer currently living in Berlin, Germany. She writes in both Japanese and German. 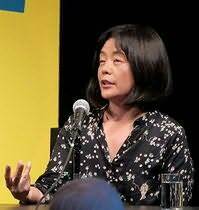 Tawada was born in Tokyo, received her undergraduate education at Waseda University in 1982 with a major in Russian literature, then studied at Hamburg University where she received a master's degree in contemporary German literature. She received her doctorate in German literature at the University of Zurich. In 1987 she published Nur da wo du bist da ist nichtsAnata no iru tokoro dake nani mo nai (A Void Only Where You Are), a collection of poems in a German and Japanese bilingual edition.